As of April 2017, McCormick has discontinued this product. The recommended replacement is 4 x McCormick Imitation Vanilla Flavor 32oz, which may require adjustments to your recipes since it's a 1-fold concentration. Also McCormick no longer packages extracts and flavors in gallon sizes. 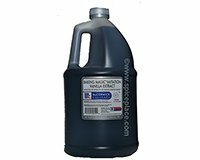 McCormick Vanilla Extract is available as a pure vanilla or imitation vanilla extract or as an imitation Vanilla flavor. The main difference between pure and imitation extracts is that the pure products are made entirely with natural vanilla beans; imitation extracts may use other natural and artificial ingredients to create a vanilla flavor. Imitation Vanilla Flavors differ from extracts because they do not contain alcohol; they do, like the imitation extracts, use both natural and artificial ingredients. Imitation vanilla extracts and flavors have never been able to duplicate the delicious flavor of McCormick Pure Vanilla Extract. McCormick Baking Magic Vanilla extract is 2-fold otherwise known as double strength. Imitation Vanilla Extracts and Flavors rely completely, or in part, on artificial flavors rather than the vanilla beans for its flavor. The aroma of imitation vanilla is more straightforward than the pure extract. Imitation vanilla extracts and flavors are the stronger in flavor and retains its flavor even when cooking at very high temperatures. Artificially flavored vanilla products will last longer and not discolor. Ingredients: Water, Propylene Glycol, Alcohol (10%), Vanillin and Other Aldehydes, Caramel Color, and Flavoring.